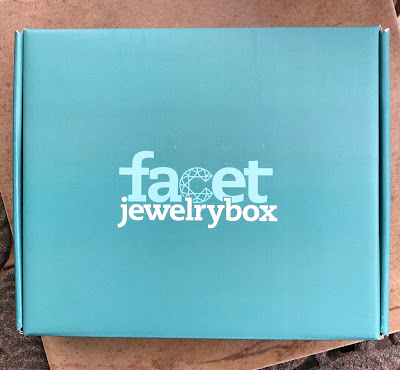 I was recently asked to review a Facet Jewelry Box (by Kalmbach) - I said yes, of course! I was given a choice of either the Stringing Box - 2 quick and easy projects - or the Stitching Box - 2 more intricate, advanced needle-and-thread projects. Since I love bead weaving I chose the stitching box! I received it very quickly. 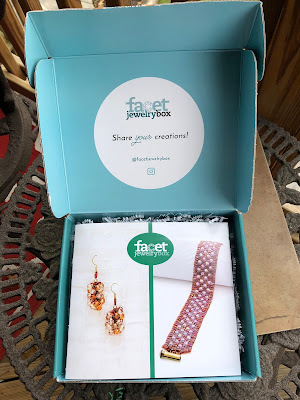 Please note, the box I received is no longer in circulation, but you can sign up for the November box and future boxes through Kalmbach here. The projects come in this sweet blue box, very nicely and safely packaged. When you open it, here's what you see - as you can see, you get a book of instructions and photos of both projects included in the box. Here is a photo of the box, the instruction sheet and the projects - they are nicely packaged individually and labeled so there's no hunting around for parts or beads! You also receive a spool of fireline that's large enough for both projects. 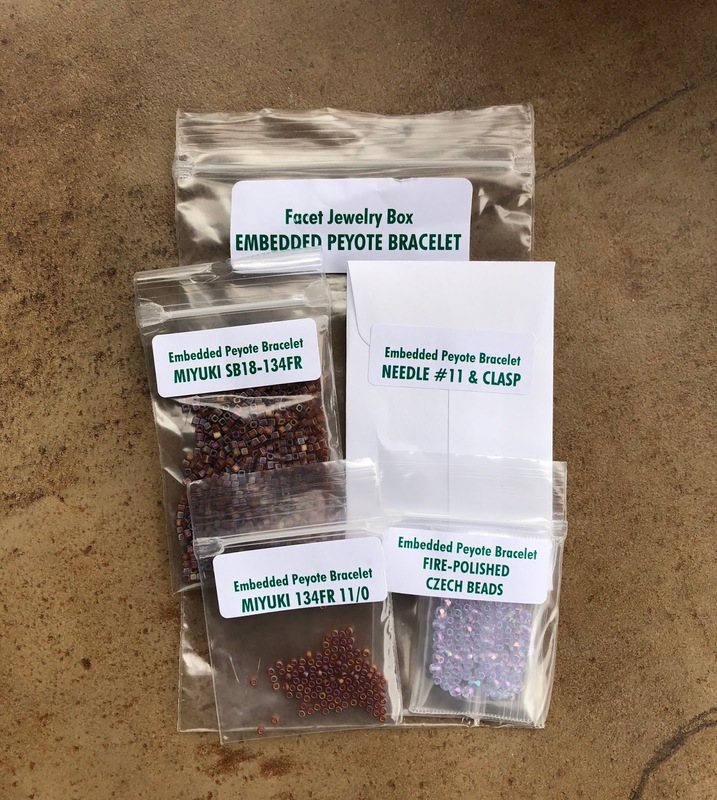 The first project I received is the Embedded Peyote bracelet - this looks fun, and I like the colors, especially for the holidays! I think this would make a great gift. 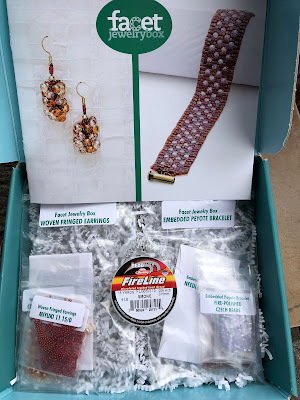 What's also great is that you have the instructions so you can purchase more beads to make more bracelets! 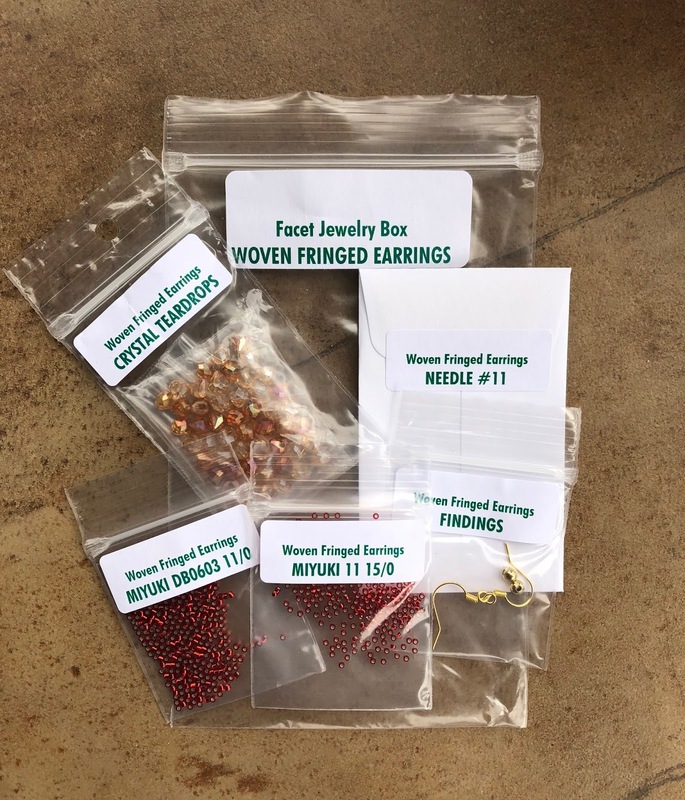 The second project is Woven Fringed Earrings - enough beads for the pair of earrings and all the findings as well. Again, great colors for the holidays! And finally, here's a photo of the instruction book. You receive clear photos and instructions to make your pieces, and as I've mentioned, you can make the projects again and again with your own beads and findings. You can find previews of future boxes on the Face Jewelry Box FACEBOOK and INSTAGRAM pages, just follow the links! 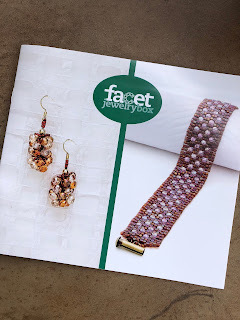 AND in addition to all this, Facet has given me a COUPON CODE for you to use, to receive HALF OFF your purchase of your FIRST BOX when you use coupon code HALFOFF at checkout - Facet link here! I will publish another post when I finish the projects - I wanted to get this info out there in case you're interested in using the coupon for either a gift for someone or yourself! I'm going to CA for a week with my mom, so that's probably a good time to get them done! I'll let you know here and on my Instagram!